A BSN student raising his question during the open forum. 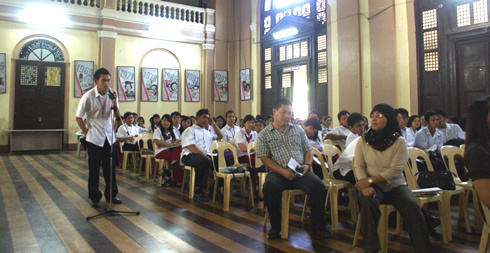 College of Nursing held its 2nd Research Forum at the College of Education, Social Hall last January 28, 2011. The event served as a medium to disseminate different researches of the college. There were four presentations of different researchers as follow: Emotional Intelligence and Job Performance of Staff Nurses Working in the affiliate Hospitals of Western Mindanao State University, Zamboanga City by Prof. Florence A. Alcazar (Faculty); Family Planning Program Implementation at the Barangay Level by Dr. Susan P. Dela Cruz (Faculty); Roper-Logan-Tierney Model in the Management of Client with Oxygenation Problem (CHD &CVA) of Joyce Ann L. Esing (Graduate Research); Utilization of Chlorine Generator as an Innovative Technology on the Promotive and Preventive Aspects of Primary Health Care by Edade Roulette R. Topacio (Student Research). After each presentation there was a 5-minute open forum for clarificatory questions. “In the profession that we are in, there is a need of an evidence-based practice,” CN’s Dean, Dr. Gloria G.Florendo stressed out during her welcome remarks. She added, “This forum is dedicated to all those who find it useful.” Present during the affair were Dr. Julieta B. Tendero (Research Utilization Publication Information Dissemination Director), Prof. Eladia U. Rivera (CN Research Coordinator), Prof. Ma. Joselyn C. Biong (CN Department Head), Prof. Miriam O. Kanti (CN Community Extension Coordinator) members of the faculty and CN student nurses.